As the The Rise of Superheroes and Their Impact On Pop Culture edX course winds down, my extra curricular activities have not stagnated. In fact, I’ve dusted off a few academic books about comics to further my station (in an audited class—I was never one for impressing actual teachers). A few weeks ago we talked The DC Comics Guide to Writing Comics. This week, I completed Fred Van Lente and Ryan Dunlavey’s illustrated Comic Book History of Comics and am still processing what they’ve done. By breaking down the history of comics in the selfsame sequential art medium, they have achieved nerd nirvana. Not since Scott McCloud’s Understanding Comics have I felt such a connection with the books I love so much. I was lucky enough to speak with the ‘Evil Twin Studios’ artist Ryan back in 2013 for the debut of Action Presidents #1 (George Washington). The team have been working on these educational funny books for a few years, with the award winning Action Philosophers series breaking down the ideals and biographies of famous philosophers as cartoon superheroes, making it easy for a lay person (and especially lazy academics like myself) to understand. Van Lente is a very well known comics writer, adding to the history of modern comics with such great runs on Amazing Spider-Man, Incredible Hercules, Cowboys & Aliens, G.I. Joe and he currently cranks out a number of great titles spanning from Ivar: Timewalker, Archer and Armstrong and next month’s Book of Death: Legends of the Geomancer for Valiant Entertainment. Ryan’s fun illustrative style are perfect for these titles, borrowing as much from Mad Magazine and Groo to Peanuts, Calvin and Hobbes and Fred Hembeck. You can tell Ryan is such a skilled cartoonist in the varied amount of styles the book urges him to pastiche and emulate in a book who’s first words are “This comic book is a work of historical scholarship”! Comic Book History of Comics seeks to educate both the super comics fans as well as casual readers by starting on the date of October 18, 1896 when a comic strip The Yellow Kid was produced in a newspaper. Thankfully, this book doesn’t go all the way back to ‘cave paintings’ or medieval scrolls as many art history books do when related to comics. Not that those cave dwellers or knight errants are wrong, but no need to retread that when there is juicy Jack Kirby, Joe Simon and Stan Lee gossip to get to. Lots of key important figures that you might have more indirect ties in your mind to the comic book industry, such as Walt Disney, copycat Roy Lichtenstein, EC Comics Bill Gaines are addressed in the context of the text where appropriate. Of course the big stars Jerry Siegel and Joe Shuster, Steve Ditko, Osamu Tezuka, R. Crumb all the way to heroes of my generation — the Image Revolution — are covered along with the environment and socio-political temperature of the time each creator or team was relevant. There is a through line (or ‘spine’ as Denny O’Neil would call for) in this book, and that is of the comic book industry itself, first reprinting newspaper strips, the cycles of pre-and post-WWII genre comics, the all important underground movement and the British Invasion (of comics creators, you long haired freaks!) taking us up to the present day direct market, torrenting and digital comics models. 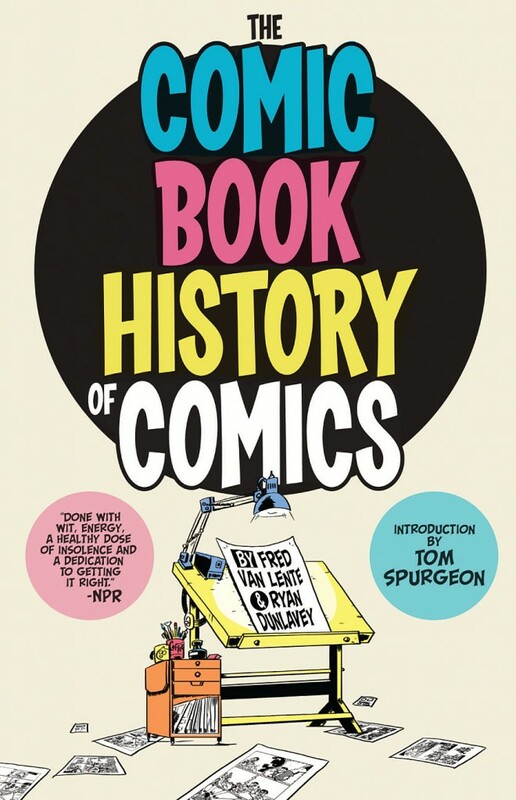 No, this isn’t a comic about the economics of the industry (though it does show what sells books), this is truly what the title claims, a history of comic books in the modern context. We learned from Professors Uslan and Stan Lee in the comics course that comics are a reflection of the time and environment that they are created in. CBHC travels the world with its brilliant narration and illustration to show how European comics and Japanese comics developed without the influence of American Superheroes. For the faithful and for the first time ever in print starting on page 175 is the complete story of Marvelman/Miracleman/Captain Marvel/Superman möbius loop…of History! Yup, even the weird Todd McFarlane / Neil Gaiman tug of war over rights is resolved on the page. Comic Book History of Comics can and should be required reading for any art history or comics historian buffs. For someone with at least a shelf worth of these types of books, CBHC is by far the most accessible and covers the most topics. All the while, this is done by using the greatest storytelling tool of all — humor through clever pictures. Credit goes to both Fred Van Lente and Ryan Dunlavey for what should be considered ‘The Text’ on Comic Book History 101. Van Lente’s research exposed a lot of things I didn’t know about the industry and comics code. Dunlavey’s art has so many caricatures on the page, references to movies and of course comics characters, and inside jokes for the advanced student. See if you are able to recognize that it is Mister Miracle convincing Jack ‘King Kirby’ to “USE THE BOOM TUBE” to defect from DC to Marvel! This book, combined with the force of McCloud’s Understanding Comics and Making Comics will make you a better expert than you think you even need to be. If you absorb anything, feel free to drop facts about Eisner’s graphic novels or the origin of The Fantastic Four while getting your weekly stack. You’ll either impress or annoy depending on your approach, but this will separate the wheat from the chaff as you persuade your associates to order Comic Book History of Comics from the LCS. Thank you for that awesome article. Have you heard of the “Pre-History” editions of this IDW limited series? Where can I find info on these, please?